The Town of Winterville is in the process of updating our Comprehensive Land Use Plan. Public participation, input, and feedback are essential to this effort to ensure that the plan best reflects the vision, principles, and interests of community members. The Land Use Plan is a document designed to guide the future actions of the Town. It presents a vision for the future; with long-range goals and objectives for activities that affect the community and local government. This includes guidance on how to make decisions on public and private land development proposals; the expenditure of public funds; cooperative efforts; and issues of pressing concern. 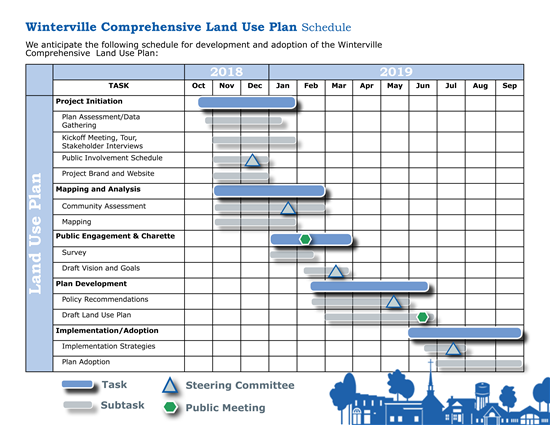 We will use this site to keep you informed throughout the project on upcoming meetings, useful information, and ways you can stay involved and voice your opinions on how to plan for Winterville’s future development! Take the Survey- Do you have a vision for the future of Winterville? Share your concerns and ideas about development, transportation, and recreation in Town. Participate in the Winterville Comprehensive Land Use Plan by taking the online survey here: https://www.surveymonkey.com/r/WintervillePlan. The purpose of the survey is to better understand values and priorities of Winterville citizens, and to gain insight into the type of development and improvements residents and other stakeholders would like to see within the Town. The survey will be open until March 31st. Survey responses will be combined to other feedback from public meeting participants, steering committee members, and town staff to inform the recommendations and goals of the new Town Plan. Public Meeting- Thanks for everyone who came out to the public meetings February 25-27th. Materials presented and produced during these meetings are included in the links below. If you were unable to attend, we hope that you will take the survey, below so that we can gather your thoughts and desires for Winterville! Please share the survey with friends and family! Summary of Comments: Summary of Public Workshop Meetings. *Note: Concepts shown in presentation are initial drafts and subject to significant change and refinement over the next few months.